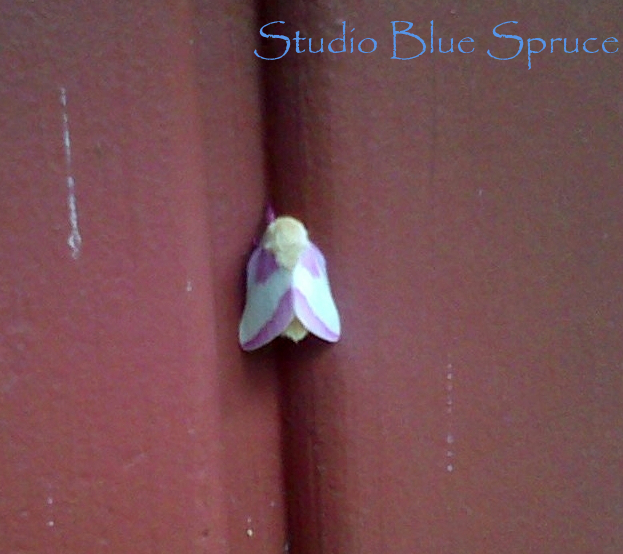 This is a photo of a Rosy Maple Moth that I found resting on a wall near my house during the daytime. It had a fuzzy yellow head, pink and yellow wings, and rose-colored feet. This has definitely been the most unusual moth I have ever seen. Soon after I took the photo, it flew away. I have been seeing a fuzzy caterpillar this fall with pale yellow-green long hair and longer black hairy spikes here and there. I looked it up in a field guide and have determined that it is a Dagger Moth caterpillar, probably an American Dagger. The book shows eleven different kinds, and they eat mainly plants of the rose family: cherries, juneberries, and hawthorns. The term “dagger” refers to the markings on the wings of the moth, that look like dashes. The moth itself looks kind of like tree bark, an excellent camoflage. They overwinter and turn into adults in the spring. It was interesting to see a caterpillar so late in the season.